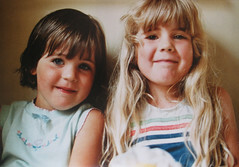 I took this photo of my nieces about 20-25 years ago. Lovely photo. I saw your comment in the Female Photographers pool, and ended up here. It's interesting to see what you're doing. Your photos are gorgeous! What type of camera are you using?? Hi Brooke, Thanks so much! Go ahead and email me if you want to talk camera equipment. I looked at and bookmarked your blog. I see you are in Provo. (I went to BYU). Hope to hear from you soon! Wow, you were even good at this that long ago??? You're that old? Were you taking photos when you were like three years old or something? Thanks, but you can only see the side of my head, so, how do you know? hehe. I've been taking photos since I was a little kid, the good old brownie box camera was a joy!!! oops, must have been a senior moment!